Yourpropertyreport.com is an easy to use browser based report upload / download system. There is no need for complicated passwords and time consuming account creation steps the other systems require. You simply send your clients a link to download their report, then they either go to www.yourpropertyreport.com and enter your name and the report code and click "download", or they click directly on the link you send then. Their inspection report is then instantly viewable by the client right in their own web browser. The they can view, save and print out their report. With yourpropertyreport.com you simply login and upload your finished inspection report. Your report is immediately ready for your client to download. You can then either copy the link or email your client the link using the easy online email interface. It just can not get any faster or easier than this! The whole process takes less than 10 seconds from start to finish! Your client goes to yourpropertyreport.com and enters in your inspector code and report code you sent them in the email. 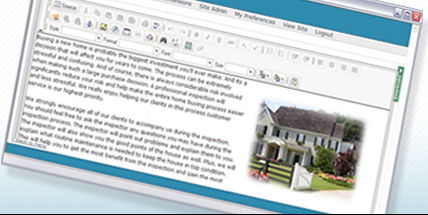 Your finished report downloads and is instantly viewable by the client right in their own web browser. You client is sent the the full url in the email message allowing them to download their completed inspection report with one click. They do not have to go to www.youpropertyreport.com first. A basic account is absolutely free and will work well for most home inspectors. If you operate a busy inspection business you may need more disk space and/or data transfer. For those inspectors we offer 100Mb and 200MB upgrade packages for $4.95/mo and $9.95/mo respectively. If you need more, contact us for a custom quote. Can I use this system right in my own website - so my clients come to my website to download their report? Yes you can. I offer a "White Label" service for only $4.95 per month in addition to your monthly inspectorsites.com fee. I charge a one time $29.95 setup fee to create the necessary pages in your website to use this "white Label" service. Your clients will not know your using yourpropertyreport.com, they will only see your website and your download system. This "White Label service is only available to inspectorsites.com customers.